HMDT is a proud member of the UK delegation to the International Holocaust Remembrance Alliance (IHRA). With 31 member countries from around the world, IHRA works to strengthen, advance and promote Holocaust education, research and remembrance. HMDT works alongside experts in the field of Holocaust remembrance and education, who together form the UK delegation to IHRA. The delegation is led by Lord Pickles – the UK’s Special Envoy for Post-Holocaust Issues, and HMDT’s Honorary Vice President. The national government of each member country forms a delegation, generally consisting of leading educators, academics and representatives of museums and memorials. The Chairmanship of the IHRA is held each year by a different member country on a voluntary basis, which hosts two plenary meetings in their country. Find out more about IHRA here. 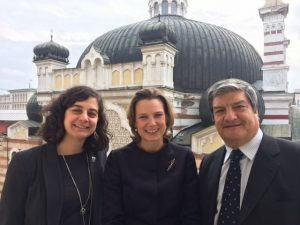 Olivia Marks-Woldman, UK IHRA Delegation, Katharina von Schnurbein, European Commission Coordinator on Combatting Antisemitism, and HE Sandro De Bernardin, Head of the Italian Delegation to the IHRA at the Sofia Synagogue. Our Chief Executive, Olivia Marks-Woldman is the incoming Chair of the Committee on the Holocaust, Genocide, and Crimes Against Humanity. It shares IHRA expertise on the Holocaust with those active in preventing and combatting genocide and crimes against humanity. As with other IHRA committees, the committee brings together experts from a range of professional backgrounds and countries to recommend multidisciplinary solutions to persistent challenges. You can find out more about IHRA's structure here. HMDT endorses and promotes the IHRA Working Definition of Antisemitism. This definition was adopted in May 2016 and was the product of an international effort to define antisemitism and provide illustrative examples. The definition has been adopted by the UK Government, public bodies, religious groups and many councils across the UK. Manifestations might include the targeting of the state of Israel, conceived as a Jewish collectivity. However, criticism of Israel similar to that leveled against any other country cannot be regarded as antisemitic. Antisemitism frequently charges Jews with conspiring to harm humanity, and it is often used to blame Jews for “why things go wrong.” It is expressed in speech, writing, visual forms and action, and employs sinister stereotypes and negative character traits. Read more about IHRA's Working Definition of Antisemitism here.